On September 29, 2010, we blogged about a little movie filmed in Alaska called Everybody Loves Whales. It was later renamed Big Miracle. Earlier this month on February 3, 2012, Universal finally released this much-anticipated family movie to the delights of audiences of all ages. They also had to make do with the limitation of supplies in the city of 280,000 people. “We bought the town out of shellac about six times,” says Coates. Alaska Sea Life Center is Alaska’s only public aquarium and ocean wildlife rescue center, located on the shores of Resurrection Bay. Their website boasts that “visitors to this ‘window on the sea’ have close encounters with puffins, octopus, sea lions and other sealife while peeking over the shoulders of ocean scientists studying Alaska’s rich seas and diverse sealife.” The Center is a private, non-profit corporation with around 105 full-time employees, including a dedicated staff of volunteers and interns. The scene where Rachel Kramer dives into the cold water to check on the whales was filmed at the Alaska Sea Life Center in Seward, Alaska. She also learned how to dive in frigid cold water there. For more details, watch this wonderful video interview of Drew Barrymore, filmed on location at the Alaska Sea Life Center. In the movie, the rescue attempt is spearheaded by the passionate and abrasive Greenpeace volunteer Rachel Kramer (Drew Barrymore) and the mild-mannered local news reporter Adam Carlson (John Krasinski). In real life, the rescue effort, known as Operation Breakthrough, also generated international media attention and involved dramatic rescue efforts from multiple governments and organizations, including of course the local people of Barrow, Alaska themselves. Below is a screenshot from the movie of the breathing holes dug up by the locals to help the whales swim out to the open water. Inspired by the 1988 real-life whale rescue effort in Barrow, Alaska (and based on the 1989 book Freeing the Whales by Tom Rose), Big Miracle retells the touching true story that captured the hearts of people around the world - about a family of three California gray whales (affectionately named Fred, Wilma and Bam Bam) who were trapped in the rapidly-forming ice of the Arctic Circle. Filmed entirely on location in Barrow, Anchorage, and Seward, Alaska, Big Miracle’s setting is chillingly authentic. Literally. If you’ve never spent winter in Alaska, you will get to experience winter in Alaska now ... through Big Miracle. You’ll also get to meet the wonderful local folks of Alaska, many of whom participated in the making of the movie. If you’d like to virtually visit Barrow, here’s a charming slideshow of the northernmost town in America. For information on Anchorage and Seward, visit the Anchorage’s and Seward’s website. Because of extreme temperatures in Barrow during the fall of 2010, many of the Barrow scenes inBig Miracle were filmed in Anchorage (which was considerably warmer). Location scouts managed to fill most of the set requirements with existing homes and businesses in Anchorage. The production crew then expertly transformed the Port of Anchorage and a few areas of downtown Anchorage to its original 1980’s look, so that they could stand in for Barrow at the time of the whale rescue. Nelson Coates, an Emmy-nominated designer whose work includes The Proposal in 2009, designed many of the film sets in Anchorage for Big Miracle. Coates was so good at his job that his Barrow town sets were convincing even for the Barrow residents themselves who came 720 miles south to work as extras in the movie. 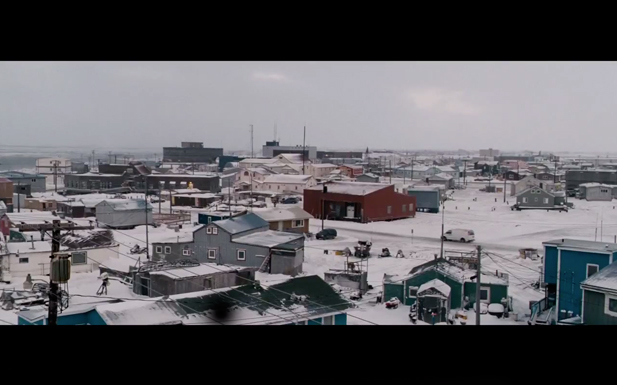 Coates admits that one of the big challenges in building the sets for Big Miracle was to make Anchorage resemble Barrow. Barrow is a small town by the Arctic Ocean. It is flat, snowy white most of the time, and barren without any trees. Anchorage, on the other hand, is surrounded by mountains and trees everywhere. Photo Credit: Above photo of the Barrow building facades is from adn.com. Below is a screenshot of a street scene from Big Miracle, complete with dog sleds, local townsfolks, and “Amigos,” the Mexican restaurant where everyone gathers in the movie. Amigos stands in for Pepe’s, the real-life Mexican restaurant in Barrow where most of the locals as well as out-of-towners hung out during the rescue of the whales in 1988. Pepe’s has been Barrow’s most popular dining spot for years. The chef, who is Mexican, serves delicious Mexican food made with fresh ingredients. No small feat when you know that all of the food and supplies used have to be shipped in, including the fresh avocados mentioned at the beginning of the movie. When the chef takes a vacation, a friend or relative from home flies up to Barrow to temporarily take over for him. Pepe’s is hugely popular with the locals in Barrow, and in 1988 during the time of the big whale rescue, it also became a favorite hang-out for reporters and camera people. To maintain authenticity in the movie, the set designers took great care to make sure that the interiors of Amigos were closely matched to Pepe’s. To prepare for his monumental task, Coates watched over 70 hours of news and documentary film. He then hired the New Zealand company Glasshammer Visual Effects to build three animatronic whales that resemble in appearance and movements to the actual whales from the news and documentary films. With Skype as their main tool of communication, Coates and the folks at Glasshamer discussed and updated each other on the creative progress of the three whales and the rigs needed to bring them to life. The day the whales arrived on the set of Big Miracle was an exciting day for Coates. “Being there to introduce the whales to the director and to watch his face as they went through their paces was one of the best moments ever,” he shared. Photo Credit: Photographer Bill Hess. During my research for Big Miracle, I found a series of articles and photos of the rescue effort taken in 1988. I also came across a great video interview of TAPS founder Bonnie Carroll (whom the movie character of Kelly Meyers is based on). It turns out the love story from the movie is based on a real-life love story after all. Directed by Ken Kwapis (He’s Not That Into You), Big Miracle is an inspiring story not to be missed, even if you’re not a die-hard environmentalist. And the stunning landscapes of Alaska is such a visual treat to see on the big screen. Having the production filmed entirely in Alaska has tremendously lifted the state’s economy. During the 10 weeks of filming, Big Miracle brought in over $7.7 million spent on goods and services with 80+ different businesses throughout Alaska. The movie employed more than 80 Eagle River residents as extras. Many more behind-the-scenes workers were hired from all around the state. “We cast on this picture from Barrow to Bethel,” says Schildt, the production manager of Anchorage-based production company Piksik LLC. The making of Big Miracle employed over 1,300 Alaskans. Alaska offers a filming incentive program of up to 44% in a transferable tax credit. This year, their budget allows up to $100 million of incentives with a minimum spend of only $100,000. This generous program entices not only the big budget productions but also the indie filmmakers to come to the state. Producer Michael Sugar says that they would not be able to make Big Miracle on such a big scale in Alaska were it not for the generous film incentives. So not only does everybody love whales, everybody loves Alaska also. “It was brutal and I loved every minute of it,” shared Kwapis when asked how he liked his experience filming in Alaska. “I fell in love with Anchorage. I can’t wait to go back.” The tax credit for Big Miracle is the largest single subsidy awarded under Alaska’s film incentive program - to date. One of the major draws of filming in Anchorage not only has to do with the original story taking place in Alaska and the look of, you know the cast, the day-players we were able to get because of being Native, but the overwhelming choice has to do with the incentive and tax investment that the state is willing to make in the industry. If there was no tax incentive, we wouldn’t have been in Anchorage. For information in filming in Alaska, visit the Alaska Film Office’s webbsite. Photo Credits: All images with black borders above are screenshots from the movie.